Happy Thursday lovelies!! I am so excited to be guest co-hosting this week’s Spotlight Link-Up this week with Jacqueline and Elle. 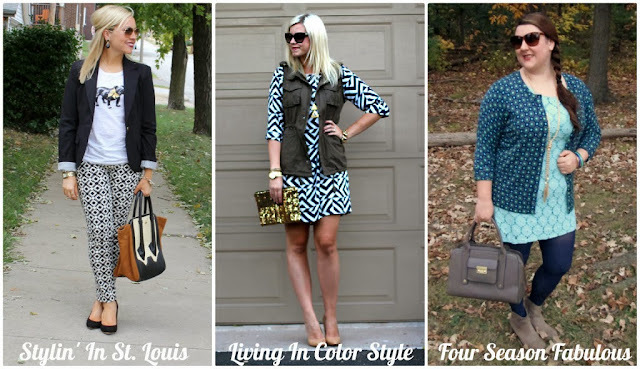 Every week these incredibly stylish ladies host a link-up for all things fashion. This week’s theme is geometric patterns, which are an easy way to add a little punch to an outfit. I love, LOVE the dress that Elle is wearing, its a great print and very versatile, especially if you are going from work to play without a lot of time to do a complete wardrobe change. Jacqueline’s pants are such a cute print, and although I am still a little hesitant to wear patterned pants, she is totally rocking them, especially with her pup tee and blazer, perfection! Be sure to check out each of their posts for more details. 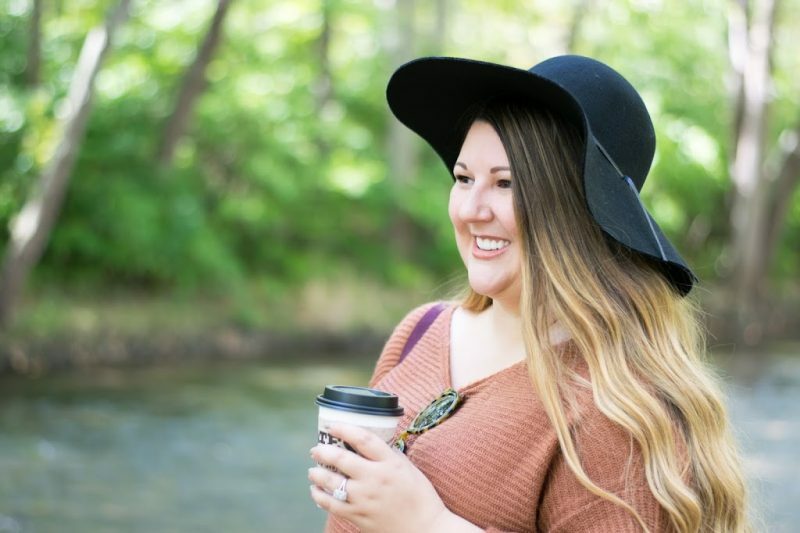 I decided to use this post to show one of my go-to ways to transition my summer dresses for fall wear. Its nothing ground breaking, and I bet you have seen this formula all over Pinterest and the blogosphere, but here’s my take. As a huge fan of tights, especially colored tights, I obviously advocate throwing them on with your fave dress as the temps start to drop. When selecting tight colors, I opt to use neutrals or muted toned tights when my outfit is full of brighter colors, and select brighter hues when my outfit is more subdued. Leggings are also a great option for keeping your stems warm. Next, trade out your wedges for booties or boots, maybe throw on a pair of knee-high socks or leg warmers with your taller boots for another peek of color. Lastly, grab a cardigan, vest, and/or jacket – leather, jean, military, or otherwise (I personally tend to grab at least 2 of those 3), and you are good to go. Layered to perfection and warm too! Since I tend to gravitate towards mixing patterns, I love the idea of mixing in different textures too as the weather changes. This soft knit printed cardigan with the lace shift dress is a perfect example. The lace is both a texture and pattern, so mixing with the geometric patterned cardigan feels natural to me. As the weather gets colder, I tend to add layer upon layer, I just can’t help it, its a sickness I swear! I am so excited to see how all of you style your geometric patterns this week! Even if you don’t have a geometric pattern to showcase, we would love for you to share your favorite post. The inspiration I get from my two co-hosts and all you fashionable ladies is boundless! It’s so fun to check out what other girls are wearing as they move fully into fall fashion too. Loving that tassle necklace! Loving all the mismatched details! You look great! Love your outfit. The mix of green and blue is a great colour combination. great mix with patterns and love that tassel necklace. I have that dress in white, but the mint is gorgeous! I love the different patterns, colors, and textures you mixed.